Según ha podido saber El Confidencial Digital, de fuentes de la cúpula económica del Gobierno, con esta “línea de crédito extraordinaria” Moncloa va a tratar de hacer frente a uno de los mayores problemas económicos que debe resolver el país el ejercicio que viene.El préstamo, que se calcula que rondará los 10.000 millones de euros, vendrá recogido en las cuentas públicas para 2018. Unas cifras que el Gobierno aprobará en el Consejo de Ministros de mañana, viernes. Don Quixote is from a village called La Mancha of Spain. This village is where the story begins and plays a large part in who Don Quixote is. From this village Don Quixote was quipped, by himself, as Don Quixote de La Mancha. 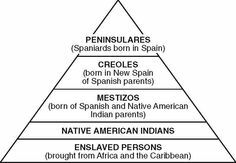 This is an image I found on the internet of the five classes of people in New Spain. While Mundy’s approach to the production of maps in the Spanish empire centers on the figure of the king and his connection to territories near and far from him, she does so in order to exemplify the way man in 16th-century Europe positioned himself within the world. Through this view, for example, the maps serve as a way for Phillip II to legitimate his rule over the empire, especially in the New World territories. Mundy's research questions explore why different/varied methods of representation were important in the 16th-century European context (i.e. choreographic vs. geographic maps), and how these translated into understanding space in New World from an Old World perspective. In order to answer her main questions, she examines two mapping commissions ordered by Phillip II and carried out by Anton van den Wyngaerde and Pedro de Esquivel. She identifies the distinct methods of representation used by the artists taking into account the broader historical and geographical context that would eventually influence the way the territories in the New Spain would be represented, as happened with the creation of the Relaciones Geograficas in New Spain. Mundy effectively help us understand the significance of mapping (along with the different methodologies of doing so) from a conceptual as well as a methodological point of view. Her analysis, as well as contextualization of the van den Wyngaerde and Esquivel maps offers a glimpse onto the conceptual frame that informed Europe’s initial understanding of the New World as part of the greater whole that was the Spanish empire. However, as she stresses the importance of the tangible nature of the lands (at least through maps), her visual examples become limited as she only provides an example of Esquivel’s work. It would have been very useful to compare it to the work of van den Wyngaerde (the distinction between choreographic and geographic maps remained unclear without a visual aid). Mundy's contribution lies in prompting us to think about different ways of engaging with space, and what that engagement signifies within a given context (i.e. for Phillip II, engaging his New World possessions through visual representations of the maps legitimized his status as king given that he could not physically rule overseas, thus he still has control over this space). This article discusses the recent wave of immigrants from Venezuela to Spain. Some interesting points are that Venezuelans do not need tourist visas to visit Spain and the paragraph on the emerging political party Podemos and its connections to the Venezuelan government. The Spaniards completely took control. Would God be happy with this statement?